Released on Monday 1st July 2013. This is the 71st release on Stories In Trance. We proudly present David Surok with the double A-Side Breeze / Tornado. David Surok made an immediate impression with his first ever release Sunset / Sunrise (SIT #47) in November 2012. This was followed by his excellent remix of Alex Blest & Stonewave's Ethereal (SIT #49), his next original Never Let Me Go as featured on the Endeavour EP (SIT #51), his remix of French Skies The Wings Of A Dream (SIT #58) and his fourth original Avalon (SIT #62). David is back with Breeze / Tornado and it's more of the quality we have now come to expect from him. On offer here are two energetic and uplifting trancers with great lead melodies, excellent percussion and structure with subtle yet potent touches. Yet more fantastic productions from a very exciting new producer, and two fine further additions to his impressive catalogue of work. 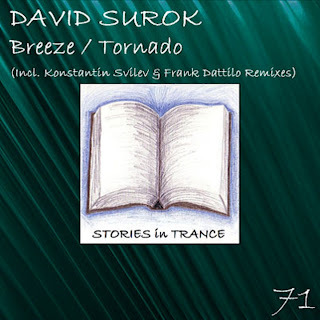 The first of the two remixes comes from Konstantin Svilev with his version of Breeze. Konstantin made his debut for Stories In Trance on our Endeavour EP (SIT #51) with City and backed that up with his remixes of Four Points' Bridgestone (SIT #52), Lev Rubel's Share Your Moment (SIT #61) and a brilliant remix of Sakiva's Hammer (SIT #69). His first solo release was the old school Bonzai inspired Exit (SIT #56) which he followed with his second independent release The Jewel That Was Ours (SIT #70). He is at his best again with this energetic and ever progressing original. A great lead is backed with fantastic atmosphere, excellent mids and subtle yet unmistakable percussion which all add up to a wonderful remix. Be sure to check out more of Konstantin's work with us in 2013. The second remix comes from upcoming Italian producer Frank Dattilo with his rework of Tornado. Francesco made his debut for Stories In Trance with his delightful remix of Colours (SIT #70) and if he continues to show the promise displayed so far he will go a long way. An energetic and powerful rethink of the original, using the lead expertly with defining mids, pads and effects, this is a big room trancer that really stands out. Look out for lots more to come from this rising newcomer. Stories In Trance aims to uncover the most talented and imaginative new producers and team up with some of the more established names in the scene to work together in evolving the sound. This release sticks firmly to our philosophy of showcasing a diverse range of sounds within trance and we hope you'll enjoy the variety of imagination and creativity on offer in this release.